One of the highlighted features of this TV is the LED local dimming feature. However, this is not true backlit local dimming but in fact edge lit LED manipulated local dimming. The feature may be turned off and on so it's easy to test the effectiveness of the feature. We actually ended up turning it off most of the time due to some loss of dark shadow detail when using it. The picture characteristics of the LM8600 are excellent though with superb clarity, deep blacks and contrast, good color rendition. The only negative we noted was some jittery picture effects from over-processing, not something the average person will notice. LG's 3D Cinema picture is passive, meaning the glasses are not powered and instead the 3D images are generated by the stereoscopic images on the screen. The LG 55LM8600 does have great color renditions. It's natural and saturated at the same time – a nice combination. However, dont be mislead by the companies claim that "In 3D tests, 4 out of 5 people choose LG Cinema 3D over Samsung and Sony for best color." Color is only one part of the total 3D picture. Image depth, crisp, clean edges, brightness and contrast all combine with color to determine the quality of the 3D picture. LG leaves out these other aspects. Overall, 3D picture quality on this TV evens out at about average. The LM8600 has a Standard picture setting option that competes very well with the best picture settings we can come up with even after calibration with our professional equipment, CalPro software and the easily accessible 10 point white balance control on this TV. While the other settings were off in one way or another, the standard setting retains a realistic color balance that is very pleasing to the eye. Since edges are very soft on this TV, we are not as concerned with decreases the Sharpness setting which controls edge enhancement. This is a faster Hz rate used in the 55LM8600 to attempt to eliminate motion artifacts caused by fast moving objects across the screen. It increases the normal 60Hz rate to 240Hz. We see the jump to 120Hz as the most significant, but the worth of this feature really depends on how the TV processes the signal when using it. The matte finish coated screen in the LM8600 reflects ambient room light from lamps or other lights. It's not my favorite solution and a bit of a drawback even though it does have much better side angle viewing capabilities than other LED backlit TVs. Black levels and contrast are pretty good in the 55LM8600, while not matching the best in production. The LG 55LM8600 also receives the ultra thin 5mm (.2") panel depth and design that shows almost no bezel. You really have to look for it to see it. It's a window like effect and the most unobtrusive frame we've ever seen and we like it. The stylish design supposedly gives the viewer a more involved experience, and while we doubt that, we appreciate the minimalist and modern look. The LM8600 includes LG's Smart TV (their name for Internet TV) which touts many of the offerings present at all manufacturers these days such as Netflix, Hulu Plus, YouTube, MLB.tv, social networking site hookup to Facebook and Twitter. They offer an extensive array of Apps such as Puzzle Quest, Germs Palace, and the White House. The selection is complete and pretty compatible with other manufacturers. It's very attractively laid out and super easy to control with the Magic Motion Remote Control. The 55LM8600 includes the Magic Remote (or otherwise called Magic Wand Remote Control) for 2012 which we are excited about since we enjoyed it so much this past year. Improvements to the remote include voice recognition commands and a special 3D button which enables immediate 2 dimensional programming conversion to 3D. But there is a lack of two imporant keys on the remote – the input selection button and an aspect ration key. The point and click operation for web browsing or keyboard typing certainly saves time over any 5-way controller. But there are other times you might get annoyed with the remote. To me, it seemed that the on-screen arrow disappeared too quickly when adjusting the menu options. When the arrow disappears, you have to wave the remote in front of the TV until it knows you want the pointer arrow to reappear. It's true that the remote does not easily sit top-up, instead rolling onto its side – at least when you set it down on the couch. Anyway, the bottom line is – you will quickly get used to the Magic Remote and learn to use it (unless you have a universal remote). It will help speed things up when browsing and typing and it's overall very cool even if you might get annoyed with it from time to time. 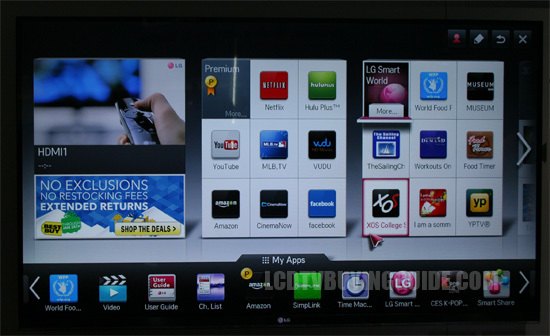 LG's Magic Remote for 2012 is an enigma, but fun (included with the LM7600). The LM8600 works with LG's new Dual Play system. With Dual Play 2 gamers playing on the same TV are no longer forced to suffer split screen. Looking at only half the screen and possibly even having the picture cut can ruin the experience in many games and Dual Play cures it. Using the Cinema 3D system both players games are projected onto the full screen at the same time and each player wears a different pair of polarized glasses so they only see their own game on the full TV screen. At $2400 to $2500 the LG 55LM8600 is not inexpensive but delivers on picture quality for sure and a host of nice features. There is lots of competition in the 55” size range from Sony, Samsung, and even Panasonic.